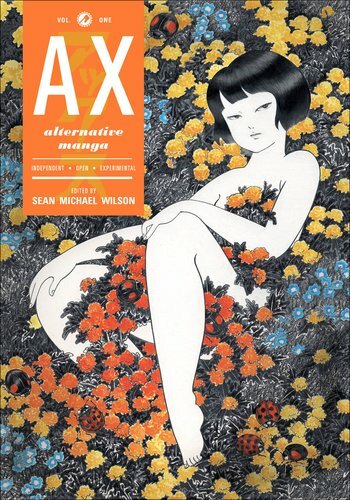 Hey, just wanted to mention, hopefully without over-promising since none of us have ever done this before, that some folks will be talking about Top Shelf’s AX anthology on Twitter tonight. We’re going to go story by story, giving quick impressions of each. Perhaps there will be a bonus round. Who can say? But it should be a fun experiment, if nothing else. We’re planning on using the hashtag #AXed, if you’re curious, and things are set to begin at 8 p.m. Eastern Standard Time. At the moment, the group includes myself (@MangaCur), Deb (About.Com, @debaoki) Aoki, Tucker (The Factual Opinion, @factualopinion) Stone, and Ryan (Same Hat!, @remoteryan) Sands. Updated: Well, we made it through about half of the book in a lively discussion that also included David (Comics Alliance, 4thLetter, @hermanos) Brothers, Sean (A Case Suitable for Treatment, @toukochan) Gaffney and Jog (Jog – the Blog, @snubpollard) Mack, which you can check out by searching for the #AXed hashtag on Twitter. I believe we’re planning to resume on Sunday, though I’m not sure on a time. I’ll post when I hear something, and I’ll get Deb Aoki’s transcript of part one posted either this evening or tomorrow morning. You are currently browsing the The Manga Curmudgeon blog archives for the day Friday, September 24th, 2010.